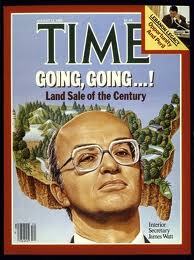 In January 1981, James Watt became the Secretary of the Interior of the United States. President Ronald Reagan’s choice of the controversial, pro-development Watt sent tremors through the environmental movement. The press was abuzz with the possibilities: stationing MX missiles in the Great Basin, opening up the California coast to oil and gas exploration, limiting the reach of the Endangered Species Act, and the like. For environmentalists, 1981 was their darkest hour. Or was it? In the wake of Watt’s appointment, enraged environmentalists signed up to social movement organizations in numbers. The Sacramento Bee (4/23/2001) quoted a Sierra Club official remembering that time: “You couldn’t process the memberships fast enough. We basically added 100,000 members.” That organization’s roster surged past 200,000 members in 1981, reaching 325,000 members the following year. Clearly nobody in the environmental movement was happy about James Watt, but his appointment triggered a rally of support for their cause. A strange exception? No. It turns out that when beliefs compete, opposition is vital. A powerful opponent makes clear your own reason for being. There is little need for the Women’s Christian Temperance Union in Salt Lake City – the Mecca of America’s Mormon population. 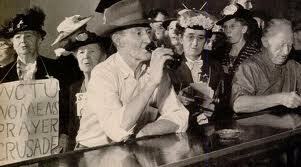 But in places where breweries and distilleries abound, temperance organizations have prospered. (See work by Professors Wade and Swaminathan on this.) When beliefs compete, opposition strengthens identity. In the marketplace of beliefs, the real competition is between the purists and pragmatists in the same camp. Once speaking to group of environmentalists, I asked who would be willing to work with Wal-Mart if this would help the environment. Half the room raised their hands, much to the surprise of the other half. A low buzz of consternation could be heard. “We need to get something done,” said a pragmatist. “Greenwashing,” replied a purist. When beliefs compete, the purists put a premium on their legitimate identity. The pragmatists opt for effectiveness, and in so doing call their own legitimacy into question. The competition between pragmatism and purity is more than personal; it shapes how organizations develop. For years, in many places small food cooperatives were the place to go for organic produce – often locally grown. Powered by pragmatists, this movement became so successful that now even mass retailers sell organic products. Good news? Not to the purists, who have seen the small cooperatives close down in the shadow of the superstores. How much simpler were the days of pure opposites – of local food cooperatives standing in opposition to “industrial” food stores. In the marketplace of beliefs, compromise triggers a competition between purists and pragmatists. Competition over beliefs is a leadership challenge: should you be pure or pragmatic? If you compromise, you get things done. But by compromising you also blur the lines, calling into question your legitimacy. The effective environmentalist is accused of selling out. The pragmatic conservative is sanctioned for being inauthentic. Yet it is those who compromise who get things done. Here is your tough choice as a leader in the marketplace of beliefs: Are you pure or pragmatic? Academic research on "oppositional identity" can be found in the work of Glenn Carroll and his colleagues.